Before he was published, Scott built a large online following by giving away his self-recorded audiobooks as free, serialized podcasts. His loyal fans, who named themselves Junkies, have downloaded over eight million individual episodes of his stories and interact daily with Scott and each other in the social media space. Scott Sigler is a major inspiration for Gun Jutsu. I have labored long and hard on many different articles and projects over the last 10 years. But every time I sat down to write, I just couldn't stand the way it came out on paper. During this time I made contact with Scott and he asked me for some technical advice. Needless to say, I was surprised to go from fan to contributor. Scott is devoted to his fans. His big kick is in killing them (by name) in his stories. For my small contribution he offered to kill me in an upcoming mini-series. I told him that he couldn't kill me until we trained together. 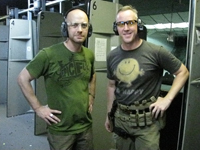 While he was on a book tour, we met and were fortunate enough to spend a couple hours on the gun range. For those who are wondering, he did very well. On my way home from the range it hit me, why not podcast? Since then, Scott has given me advice and encouragement as I've labored to get Gun Jutsu off the ground. On the day the first podcast posted, Scott featured Gun Jutsu on his blog. If you like Horror / Science Fiction / Adventure with a decidedly twisted, gruesome and profane twist you will love his original and compelling story lines. BTW, I'm still alive in the Siglerverse. He hasn't found a way to kill me yet.